You are here: Home » X-rays » Is It Safe to Get a Dental X-Ray? It can be stressful to undergo any medical procedure. But in order to correctly diagnose the problem, an x-ray is required. That is exactly what dental x-rays do. They help your dentist have a look at your condition in a deeper way. A lot of people have concerns when it comes to getting an x-ray taken. They are afraid that the amount of radiation from the x-ray could be harmful. Let us go on record and say that dental records are considered very safe. X-rays and all the other imaging procedures only use a fraction of radiation. That low dose of radiation will not cause you any harm. 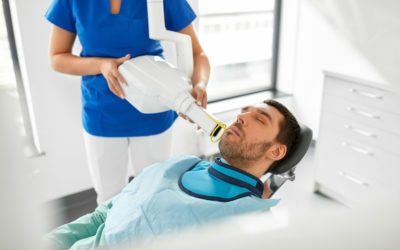 In this article, we will tell you how a dental x-ray works and tell you whether or not it is safe. Once you have all the information, you will not be on the fence on getting an x-ray. Dentists all over the world use x-ray to diagnose dental issues that are not visible to the naked eye. With the help of these dental images, the dentist can come up with an action plan on how to treat your condition. All these conditions will be almost impossible to diagnose without a dental x-ray. If the condition remains undiagnosed, you might face more issues and pain in the future. The x-ray reference also helps your dentist prepare braces, dentures, tooth implants, and other similar treatments for you. Children are more sensitive than adults, that is why a lot of parents are reluctant to get a dental x-ray done on their kids. Parents are worried about the impact of radiation on kids. However, the amount of radiation in x-rays is so low that it does not affect children. It is perfectly okay for children to have a dental x-ray. Generally, pregnant women are advised against dental x-rays. Even though the radiation is slight, it can still be harmful to the fetus. If you are pregnant or suspect you are pregnant, make sure you inform your dentist. However, in some cases dental x-rays are unavoidable. But your dentist can take all the necessary precautions to make sure the health and development of the fetus are not affected. Having a healthy oral routine is the main key here. Remember to brush your teeth twice a day and floss daily. These habits will keep most of the periodontal diseases away from you. Regular visits to your dentist are also necessary. Early detection of the problem will mean less painful procedures in the future. Contact The Gentle Dentist in Shelby Township, MI today! We would love to take a look at your smile and make sure it’s as healthy as possible. We can be reached at (586) 247-3500! We hope to hear from you soon!